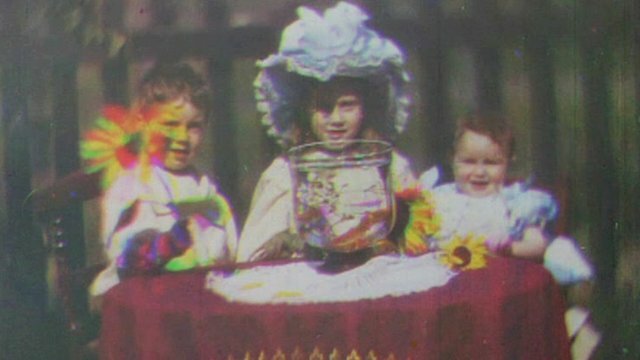 The world's first colour moving pictures dating from 1902 have been found by the National Media Museum in Bradford after lying forgotten in an old tin for 110 years. The discovery is a breakthrough in cinema history. Michael Harvey, from the National Media Museum, and Bryony Dixon, from the British Film Institute, talk about the importance of the discovery. The previous earliest colour film, using the Kinemacolour process, was thought to date from 1909 and was actually an inferior method. The newly-discovered films were made by pioneer Edward Raymond Turner from London who patented his colour process on 22 March 1899. The story of Edwardian colour cinema then moved to Brighton. Turner shot the test films in 1902 but his pioneering work ended abruptly when he died suddenly of a heart attack. Now the film has been restored by the National Media Museum and is being shown to audiences for the first time. The Race for Colour is broadcast on Monday, 17 September 2012 on BBC One South East and Yorkshire, at 19:30 BST and nationwide for seven days thereafter on the iPlayer. Note: Film archive is courtesy of the Bradford National Media Museum and The Science Museum.